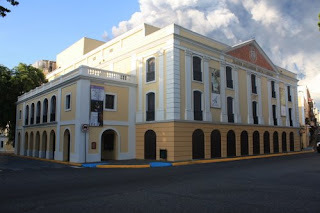 Built in 1832 (financed by subscriptions and by taxes on bread and imported liquor) and remodeled in 1949 and 1987 is one of the oldest theaters in the Western Hemisphere, was named for Alejandro Tapia y Rivera, the famous Puerto Rican playwright. Still hosts a variety of entertainment in the fine arts, plays, ballets and concerts. The Fine Arts Center opened its doors in 1981. The modern facilities offer concerts, plays, and opera. It is the largest fine arts center in the Caribbean. Daily, 10:00 a.m. - 6:00 p.m.